Classic Sunday Dinner. 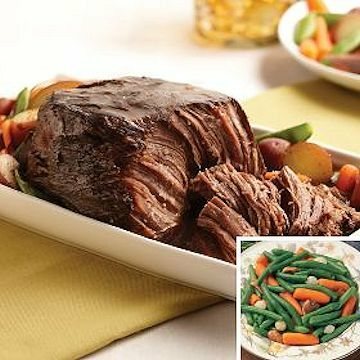 Our savory Pot Roast is slow-cooked in a seasoned au jus and served with a medley of tender carrots, green beans, pearl onions and mushrooms. Enjoy homemade flavor just like mom used to make, except you don't have to spend hours in the kitchen preparing it! Just heat and serve. Meal serves 4.